Visit our partner Brown Paper Tickets to purchase tickets! Pricing is $20, $15 for students or military, $10 for children. 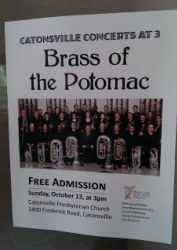 Delight your ears with the sparkling sonorities of Brass of the Potomac! This blockbuster concert features Northern-Virginia native and international trumpet superstar, Rex Richardson, performing the DC-area premier of Anthony Plog's Concerto Number 3 for Trumpet and Brass Band. The program will be rounded out by the test piece for the North American Brass Band Association Competition Championship section, Jan van der Roost's "From Ancient Times," as well as the group's exciting choice piece. We had a blast performing in the Live Arts Maryland concert series at St. Anne's in Annapolis, MD! The sextet performed originial compositions as well as many familiar tunes, including Mouret's Rondeau, Simple Gifts and The Heavens Declare. This concert featured Jeff Roskos, Manuel Muñoz, Randi Bulla, Jay Gibble, Steve Kellner, and Jarrod Williams. Thank you to everyone that came out to hear us, and we hope to see you there again next year! View photos from our performance here! We're excited to be performing at this festival on Saturday! 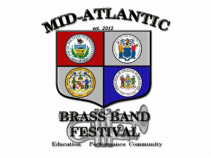 It's going to be a great weekend surrounded by great brass bands, clinicians, and soloists. Don't miss our performance and all the other events offered if you're in the area! Unfortunately due to the winter storm this concert was cancelled. Free Admission! We are looking forward to a great evening of brass band music celebrating the joy of Christmas! Great Catonsville Concert with the BOTP! We had a great time performing for the Catonsville Presbyterian's "Concerts At 3" series this evening. This was our second appearance in Catonsville, and we really enjoyed getting to visit with everyone during the post-concert reception. Thank you to everyone that came out! Stay posted for news about our next concert in December. Free Admission! Join us for a great afternoon of brass band music.